Since its creation in 1985, the Kyiv Sax Quartet has become one of the preeminent ensembles of the world under the leadership of Yuri Vasylevych (soprano-saxophone, professor of the National Musical Academy in Kyiv, Ukraine). KSQ took part in world Sax Congress commemorating the 150 years of the saxophone (Angers, 1990), the 10-th World Sax Congress (Pesaro, 1992). It has given tours in Hungary, Russia, Polend, France, Belgium, Greece, Italy, Germany, USA, Canada, , etc. Ukrainian Chamber Ensambles Competition (1-st Prize, 1987, Kyiv); International Jazz Festival "Crystal Lion" (1-st prize & Grand Prix, 1989, Lviv, Ukraine); International Wood Instruments Ensambles and Orchestras Competition (1-st Prize, 1995, Rivne, Ukraine). folk & avant-garde contepoprary musik (D.Smirnov, S.Pavlenko, G.Dmitriev, F.Hansen). and uniform sound of their instruments".
" .. An exellent and criative quartet ... an extraordinary success" . J.M.Londeix, President. of the L'association francais de saxophone. "If you've nevere heard a saxophone quartetr, the sound can be quite haunting. But the Kyiv (quartet) also boasts a varied repertoire and technical polish". "Superb performance marks anniversary of Adolphe Sax's birthday. 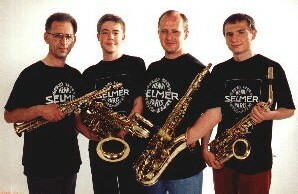 I must also be good for Selmer's business to have such fine players as their worldwide ambassadors. If I bougth a Selmer, perhaps I too could play like that. Not a chance. This is an exeeptional group of musicians".